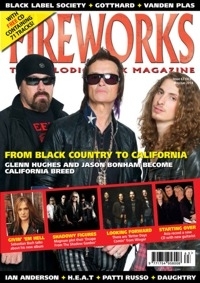 We haven't scrimped on the features either, as Glenn Hughes talks about the demise of successful supergroup Black Country Communion and how he teamed up with Jason Bonham to put together the impressive new power trio California Breed. Former Skid Row vocalist Sebastian Bach enthuses about his brand new solo album, while Asia vocalist John Wetton tells us about the band's new album and bringing in new blood to replace Steve Howe. Magnum release another great record which Bob Catley is only too happy to talk about, and Winger explode back with a brand new album. That's not all, as we have Ian Anderson, Black Label Society, H.e.a.t, Daughtry, Gotthard, Patti Russo, Sonata Arctica, Vanden Plas and many, many more - 33 interviews in total! With the usual in-depth reviews of new albums, live concerts and DVDs, along with dedicated features on books and EPs, Fireworks is indispensable in helping you figure out what to spend your hard earned cash on! If that wasn't enough, you'll find a CD attached to the issue which contains 71 tracks in mp3 format - yes, SEVENTY ONE... along with a 22 page PDF about the bands featured, absolutely free! If you can find a better value magazine for £4.99, we'd love to know about it!